If you’re new around my little corner of the internet, you might not know that I have a handmade shop! In edition to being a Blogger / Media Manager / Online Business Manager / Wife / Fur-Mom, I am also a passionate maker of handmade awesomeness! I make all kinds of things for my little Homespun Happiness shop, but one of my favorite things to create is fun, colorful and unique pieces of art for your walls, aka Hoop Art! With it being February and all, I decided some sort of Heart Hoop Art was necessary… so I started brainstorming ideas! 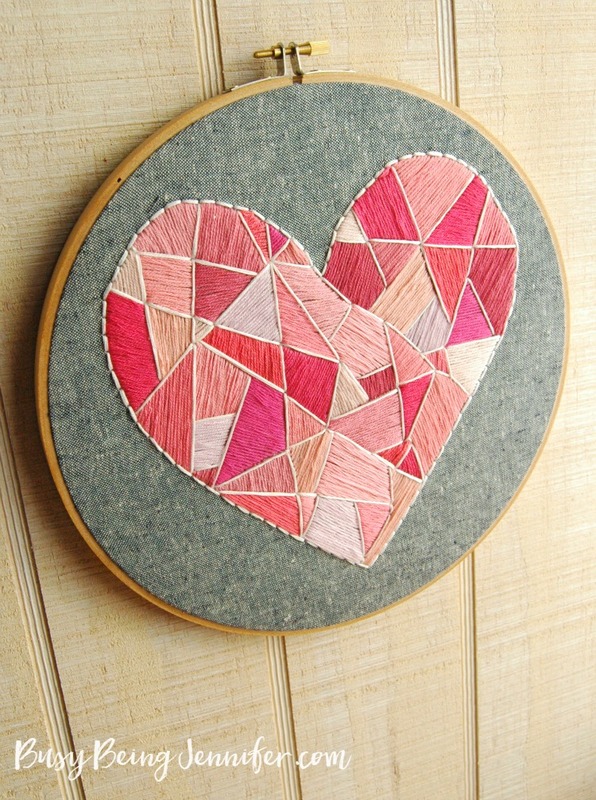 And so this Geo Style Heart Hoop Art was born… and I am in LOVE! I don’t typically give away “trade secrets” and share the patterns I’ve created for my unique hoop art pieces… maybe one day I’ll have patterns for sale… but in the mean time, this one is so simple to create on your own and SO MUCH FUN to stitch, I can’t help but share! Step #1 – Cut out a heart shape from your scrap paper. The size doesn’t matter a whole lot – it really depends on the size of your embroidery hoop and how much stitching you want to do. Step #2 – Trace the heart outline onto the center of your fabric piece. If you’re using a light pencil on a dark fabric (like shown) trace the outline a few times for better visiblity. Step #3 – Use your fabric ruler to add the geometric lines that you will use as the boundaries of your pink stitching. I just kept adding random lines until I was happy with the way it looked. Step #4 – Place your fabric in the embroidery hoop. Step #5 – Pick out the various pink embroidery flosses you’d like to use. I pulled a wide range from my “hoard”, mixing in lots of different tones and shades. Step #6 – Pick a section of the heart and start stitching! This is considered a satin stitch and these directions might be helpful if you’re a total newbie 🙂 I used the same color for 2-4 sections/locations of the heart and then moved onto a different color. I tried to vary the direction of each section as I went, so not only the color is different, but the “Direction” of the shape differs too. Repeat until the whole heart is filled up! Step #7 – To give this Heart Hoop Art the finishing touch, I added a line of white along the edge of each section and then back stitched along the outside. I liked the way it added a little more definition to each section and the outside of the heart, but this is a totally optional step! Step#8 – Secure your fabric in your embroidery hoop with a little hot glue along the inner edge. – photo tutorial for this coming soon! I am madly in love with the way this little Geo Style Heart Hoop Art turned out! I was torn between adding it to my shop or hanging it over my desk… keeping it and displaying it over my desk won out… for now! I will be adding this as a CUSTOM piece to my online shop soon! So if you really LOVE this heart hoop art, but don’t want to make it yourself, you’ll be able to order it soon! Is there anything you can’t do?! Gorg! You did a fantastic job. Very pretty! Love it and so glad you decided to share the how to Thanks for sharing on craft schooling Sunday! Lovely piece of embroidery love all the shades of pink ! Such a beautiful heart!!! I’m pinning it! How beautiful! Pining and sharing! This is a lovely project! Love it! Thanks for sharing great tutorial! This is an amazing idea! Thanks for sharing. Visiting from Think Tank Thursday. I absolutely love this! And I think that even with my shoddy hand-stitching abilities I could pull it off. Thank you for sharing! I pinned, stumbled, and tweeted. So cute for V-Day! Oops, forgot to say that I found this post through The Pretty Pintastic Party! So darned cute!! love it! That is adorable!! I tried embroidery once, it didn’t turn out well. This is so pretty and a great way to use up all that extra floss I have lying around! Congrats on being featured at Sugarbeecrafts! Thanks for sharing with us at Throwback Thursday. Can’t wait to see what you bring to the party this Thursday at 7:00. I love this!!! It’s so my style! 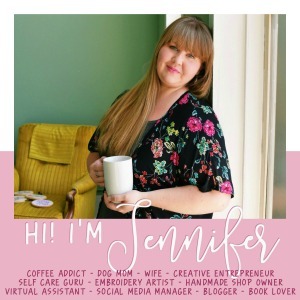 Thanks for sharing with us on the Family Joy Blog Link Party!! Really lovely! I like to draw with this kind of style but never thought of doing it with embroidery floss!! Visiting from Share Crafts, DIY Projects, Transformations link party! This is so pretty! I love to embroider but don’t often make time for it. Thank you for linking up to The Creative Exchange. We will be featuring your project this week. This is gorgeous, I love all the shades of pink. How cute is this! Love it! Shared. Thank you for sharing on Merry Monday! We hope you will join us again next week! Wow what great work, absolutely beautiful. I love that it can be kept up year around too 🙂 Thanks for sharing. Hi Jennifer! I’ve never done embroidery but I’ve been inspired as of late to give it a go soon. Thank you for the tutorial because you make it look easy and I hope it really is when I give it a try. Thank you for sharing at #OMHGWW and hope to see you next week!